Euphrasia rostkoviana - Natural Health - Lancaster and Preston . 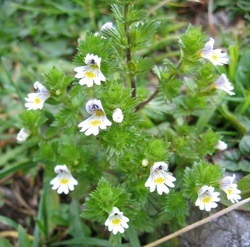 Euphrasia rostkoviana is commonly known as Eyebright. It is a member of the Scrophylariaceae family and grows in meadows and grassy places. The aerial parts are used and gathered between May and October when the plant is in flower. Euphrasia is an anti-catarrhal, astringent, tonic, anti-inflammatory for the mucous membranes and anti-septic. As an anti-catarrhal it reduces the quantity of secretions by the mucous membranes, coupled with its anti-inflammatory action it is often used by herbalists in the treatment of hayfever, colds, sinusitis and ear congestion. As its common name 'Eyebright' suggests it has particular affinity to the eyes and m ay be used in the treatment of conjunctivitis.